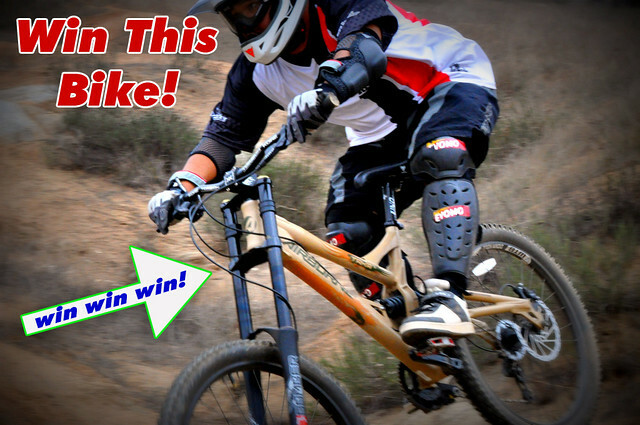 You read it right, you can win my personal race bike, the Airborne Taka. It saddens me to announce this contest because I simply love the Taka. However, due to health insurance issues, I am having to give up racing downhill. Rather than having this beautiful bike sit in my garage collecting dust, I’d much rather see it go to a good home. There’s nothing wrong with my Taka, in fact, I even have the Cane Creek Angleset installed with a 1.0 degree off-set. In order for you to win this, all you have to do is leave a comment below. All comments will be held in purgatory in order for us to filter through the spam. If you’re a legit comment, we’ll approve it. We’ll randomly choose one lucky winner from the comments. We’ll be announcing the winner this “Sunday”. Good Luck! Does this enter me in the contest? Previous PostPrevious To be as good as Art Aguilar, one can only dream…. Next PostNext We’ve got a WINNER!